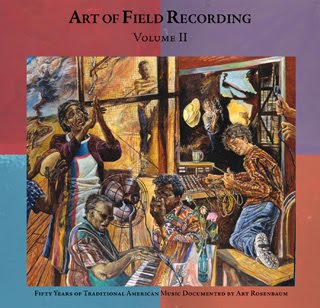 Art of Field Recording Volume II is a four disc set with a 96 page book that contains essays and annotations by Art and over 100 illustrations and photographs by Art and his wife Margo. Art took a similar approach to Harry Smith in assembling the music: the discs are divided into Accompanied Songs and Ballads, Unaccompanied Songs and Ballads, Sacred, and a Survey disc that has a little bit of everything. 13. Jake Staggers and Family - How Long the Train Been Gone? 32. Bonnie Loggins - Sing, Sing, What'll I Sing? I would love to have this but I don't have a premium account. Could you please repost this in smaller files under 200. Thanks for posting in a smaller size. I have it now and it is great, very high quality, and very interesting. Although this is the post for Vol 2, you have split Vol 1 here. I would like to get both if possible so could you do the same for Vol 2. I read some of your other sites you have a very interesting sense of humour. Are you by any chance a Brit living in the States, like me? I have always wanted to give something back to the peopls I collect from, and I would like to recommend a book to you. Have ever read "Titus Groan" by Mervyn Peake? If you have'nt, give it a try. Thanks again for Vol 1, I look forward to Vol 2.
whoops! my bad...nope, I'm a southern Californian, but i am also a child of the Beatles...thanks for the reading recommendation and I'll do the links (asap) for the other one too...sorry for the mix-up! i was wondering why i don't see the links for non-premium members? respectully waiting and thankful for you sharing this. I appreciate your work on all your blogs takes a lot of time, but I want to request something. The Art Of Field Recording Vol 2 is still not available in smaller downlods. On Vol 1 you posted smaller files for Vol 1. On Vol 2 you also posted smaller files to Vol 1. Which I grateful for. If you get time I would still like to have Vol 2 sometime. FYI the 20 cd set Triomph du R&B has a sequel The Triumph Of The Blues also 20 cd's over on jollyjokeralive-dot-blogspot-dot-com. Its a great site.